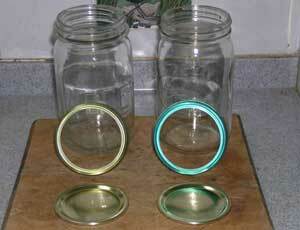 The common Agee preserving jars come in two types; newer ones and more thick-walled older ones. The older type has a thick surrounding ledge just below the screw thread and these require gold coloured screw bands. The gold bands that are sold also fit the American Mason jars. The newer preserving jars have green screw bands. The screw bands and lids are available from leading supermarkets in New Zealand. If they are not there, ask your supermarket to order them in from the suppliers; Contact perfit@xtra.co.nz. The jars are sometimes available on the TradeMe website or you will need to advertise for them. The Perfit seals manufactured today, have been made for the flawless rim of the modern preserving jar. There is insufficient thickness to the rubber seal to cater to the imperfections found in the rims of the old, thick walled jars. All the imperfections, including join marks, have to be ground away until the rim is flawless as on the modern jar. Purchase fine wet/dry emery papers. Place it on a flat sink, pour a little water onto it â€“ this helps the smooth motion that is needed and it washes away fine glass powder. Move the jar in an oval/circular manner right around the wet paper. Do it smoothly and slowly until the rim is flawless. It can take up to thirty minutes to create a flawless rim needed for the modern Perfit seal. 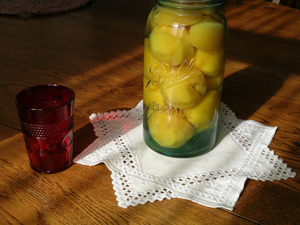 You will need approximately 72-quart jars for 50 kg of fruit if it is stacked in the jars. If fruit like Damson plums are just poured into jars, then you’ll need about 90 quart jars for 50kg fruit. 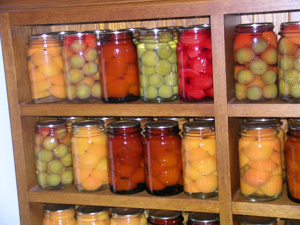 You can preserve fruit in the smaller half-size jars but they take up a lot of room in a pantry.